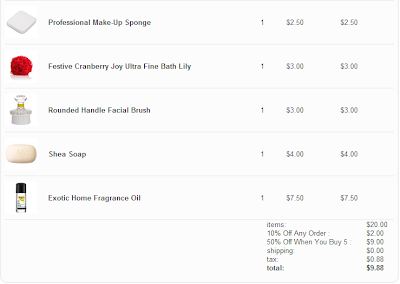 TheBodyShop.com: 60% off plus free shipping! If you are a fan of The Body Shop then you'll definitely want to check out this great deal that you can score! Currently, when you buy any 5 items (excluding pre-packaged gifts and gift cards) you’ll get an automatic 50% off during checkout! Plus you can use coupon code "JOY10" to score an additional 10% off AND stack with coupon code "FREEJOY" to get free shipping! And my total after tax for all these items came to just $9.88 shipped! 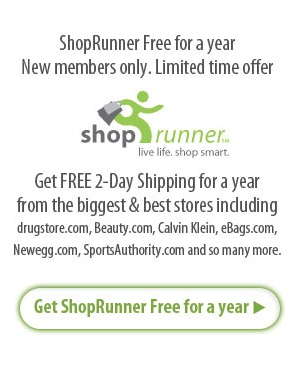 Free 1 Year ShopRunner Membership! ShopRunner offers free 2-day shipping with no minimum order size, unlimited Free Shipping on returns and members only offers! Currently you can head on over to the ShopRunner facebook page, "like" them and click on the "Today: Free Membership" tab to sign up for a free 1 year membership (a $79 value!) Just enter your name, email address, and mailing address and click to activate this offer. The payment information section is optional so you don't have to enter anything there. I recently took advantage of this deal and received an email offer that let me score a free pizza from Domino's! So, even if you're not sure if you'll use the free shipping option, it's still worth taking advantage of just to see what kind of members only offers you will receive!